Family run Marios Studios consists of two buildings in a local style, surrounded by beautifully maintained gardens illuminated at night, and full of amazing flowers and trees. The owners also have available sun loungers and a BBQ for customers to fully enjoy the spacious garden area and its peaceful surroundings. 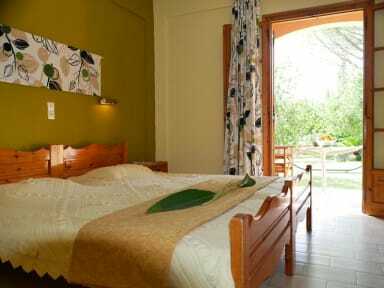 The accommodation consists of 14 open plan air conditioned studios, each one for 2 or 3 persons with single beds. All studios are equipped with en-suite bathroom with shower, toilet, hairdryer, TV, safe deposit box, separate kitchenette with utensils and cooking equipment. Towels and bed linen is supplied. All studios host a small oven with 2 electric rings, refrigerator toaster, kettle. balconies or terraces with a small table and chairs overlooking the garden.